My experience of learning French, Latin, and German in high school and college was somewhat brief, but organized. In contrast, my study of Japanese has been haphazard and largely independent, because its purpose has been "fun" (rather than passing a reading exam as a degree requirement). Even a person like me, who enjoys the structure of language, knows that grammar can be boring; its examples normally include impossibly dry sentences, such as, "I observed a girl playing with a ball." 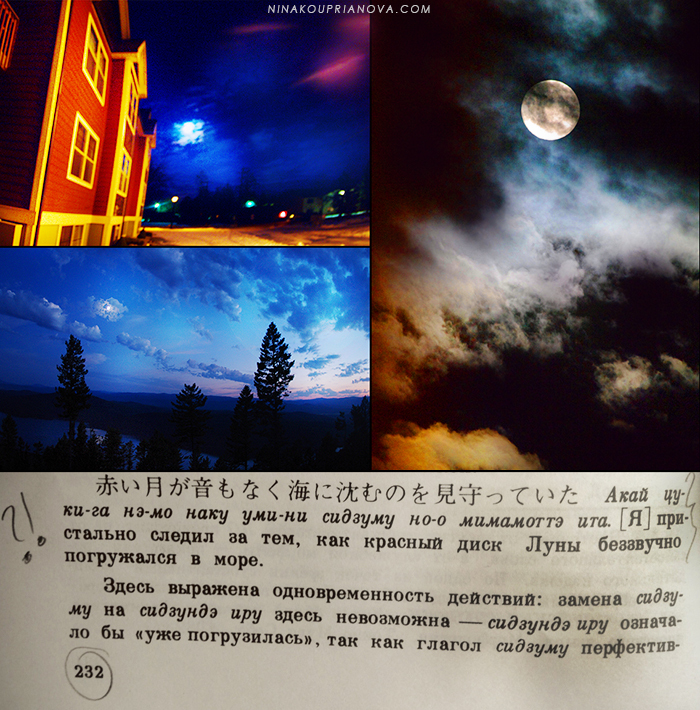 With that in mind, imagine my surprise--as I was sitting on the plane going over Japanese grammar in a sleepy haze--when I came across something so in line with what I'd photograph! "I closely watched as the red disc of the Moon silently submerged into the sea." Who knew that grammar could be so evocative and romantic? !